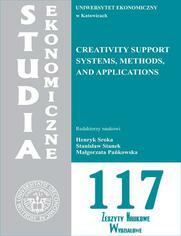 The aim of this book is to improve our understanding of creativity support system environments. The various articles analyse creative and innovative activities as carried out by individuals, groups, and organizations. The book's focus is on identifying and understanding the factors relating to the working environment that are conducive to human creativity and innovation. The book is likely to be of interest to students and scholars in a number of research fields as well as to science and innovation policy decision makers concerned with research, teaching, and policy measures for the development of creativity support system environments. Studia Ekonomiczne nr 117 Zeszyty Naukowe Wydziałowe Uniwersytetu Ekonomicznego w Katowicach.